Hoverboards, gliders, electric skateboards—whatever name they come by, you have probably seen and heard of them. These self-balancing devices are the year’s hottest electronics as people everywhere are snapping them up and buying them as presents for their loved ones. 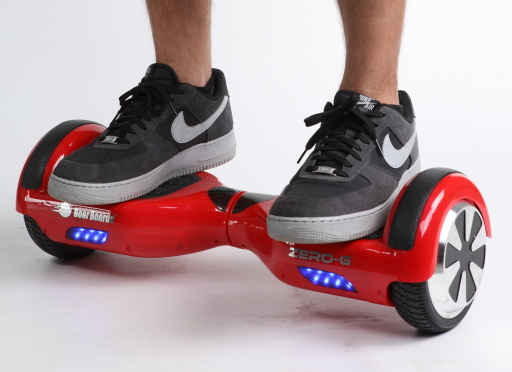 In fact, you probably know at least one person with a hoverboard on their Christmas list. As cool as they are, there’s one big problem: they are not safe to transport on an airplane. At Alaska Airlines, we do not allow hoverboards as checked luggage or as carry-on. Hoverboards are usually powered by lithium ion batteries, which are regulated by the Federal Aviation Administration (FAA) as hazardous materials. Internal short-circuits can occur with lithium ion batteries, which can then lead to a “thermal runaway” where the battery overheats and bursts into flame. Read the FAA’s general rules regarding lithium ion batteries. Hoverboard battery ratings are unreliable and have been known to catch fire, which makes them more concerning to transport on a plane. In some models, we’ve found that the batteries claimed to be under the legal limit, but upon examination, they actually exceeded what the FAA allows on a plane. In exceptional cases, as in times when you require one of these items as a mobility aid, we may allow you to bring your self-balancing device on board. However, these situations are very rare. Please see the assistive device section of our website or contact reservations at 1-800-ALASKAAIR for more information. 9 comments on "Hoverboards cannot fly: Alaska bans self-balancing devices on airplanes"
Is there any way that i can still bring my device with me?? Taking out the battery?? Bring the manufacturer manual for battery details??? Lithium batteries scare me, I am pleased to see the ban on these items. Good to hear. After seeing a video of a hover board catching on fire, I feel safer knowing they are banned. Hopefully baggage screening will ensure no one sneaks one in their bag. How about allowing folding hiking poles in carry-on luggage? I am 70 and use them for extended walking. They have rubber tips covering the not-sharp metal ends.